Tongue herpes is an infection caused by a virus called herpes simplex. It is actually an infection of the mouth as a whole, and can occur on the lips too, but herpes on tongue infections seem to be the most uncomfortable. A tongue herpes infection can cause painful sores on your tongue as well a just about everywhere else in your mouth. It can also cause symptoms such as aching muscles and a fever. Another name for a herpes infection is "cold sores". A similar condition called "canker sores" is sometimes thought to be due to a herpes infection, but there are some important differences. 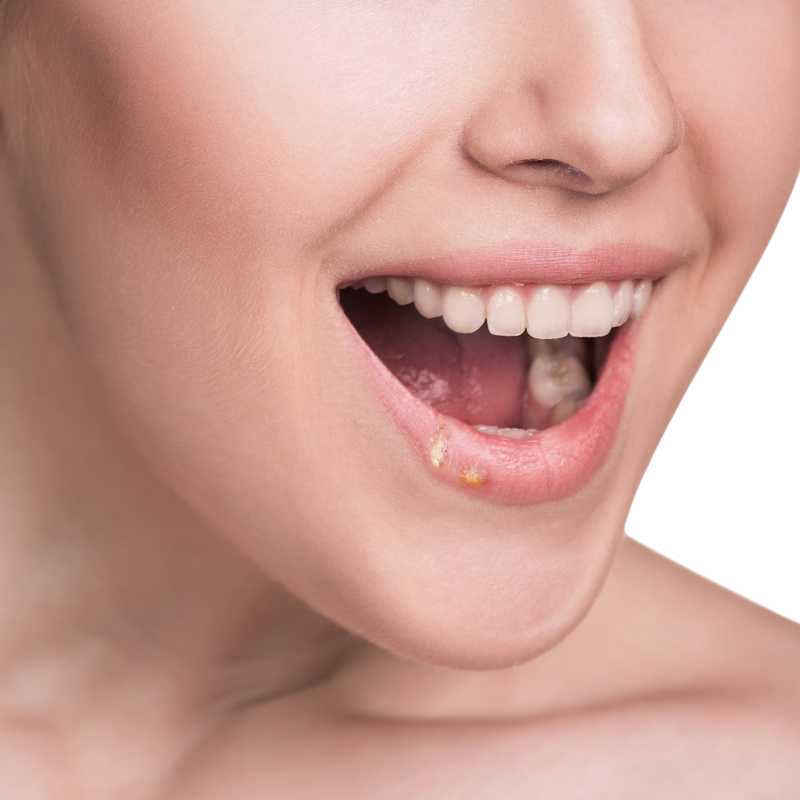 Canker sores only occur inside the mouth, not on the lips or skin surfaces. Also, canker sores aren't infectious - you can't "catch" them from someone else. Canker sores are usually the result of something irritating the inside of the mouth. They are NOT infections, they are simple mouth ulcers. Have a look at tongue ulcers for a more detailed explanation. There are two types of herpes simplex virus, called HSV-1 and HSV-2. These two viruses have distinctly different DNA, but both cause mouth ulceration. However, HSV-1 causes about 80% of all mouth infections. You can catch the HSV-1 virus just by touching any infected saliva, mucous membranes, or skin. This virus is highly infectious. Most people carry a dormant form of herpes simplex virus before they reach adulthood. After the initial infection with herpes simplex virus has happened, the virus goes through three stages. Primary infection stage: This is the first stage of the infection. The virus gets into the skin or mucous membrane, and then starts to breed and multiply. You may get a fever, a high temperature, and some mouth sores coming up at this stage. On the other hand, there MAY NOT be any sores or symptoms. You may not know that you have an infection at all! This is called an asymptomatic infection. About twice as many infections are symptomless as opposed to infections where you get some symptoms. This means that you are twice as likely to skip any of the obvious first symptoms of a tongue herpes infection. Latent stage: This is the second stage of the infection. From the infected site, the virus moves along nerve pathways to the spine, and sets up home in an area doctors call the "dorsal root ganglion". The virus continues to grow there, without causing any problems. Then it becomes inactive or "dormant". It can remain like this for many years, causing no problems nor symptoms at all. Recurrent stage: This is the third and final stage of the herpes infection. If you suddenly experience a lot of stress in your life, such as the death of a loved one or a marriage break-up, the virus may "wake up" and cause a new bout of sores. There is also some evidence that suggests that factors like excessive exposure to ultraviolet light, getting a fever, being physically tired, and changes in hormone levels may play a role. Incubation period: For herpes simplex virus type-1, the amount of time between first contact with the virus and the appearance of symptoms is 2 to 12 days. For most people the average is about 4 days, BUT this can vary a lot. The illness will last for about 2 to 3 weeks, on average. Your general health will play a major role in how quickly you get over the infection. Before the sores appear, most sufferers of tongue herpes will get a tingling or itching sensation at the site of infection. Then, clusters of blisters will appear. The blisters break down rapidly and look like tiny, shallow, gray ulcers on a red base. After a few days they become crusted or scabbed and look dry and yellow. The most intense pain is at the start of the blistering process, and may make eating and drinking difficult. As well as herpes on tongue sores, the lips, gums, throat, insides of the cheeks, and the roof of the mouth may be affected. The gums may become generally mildly swollen, red-colored, and may bleed. Lymph nodes in the neck can swell up and become painful. For some reason, people between the ages of 15 to 30 can also get a very painful throat, with grey shallow ulcers. Tongue herpes is definitely no fun! Because the tongue herpes sores are painful, people usually have difficulty eating or drinking. To prevent dehydration, you should try to sip cold water almost continuously through the day. If oral sores appear in a child younger than 6 weeks of age, notify a doctor. Complications and severe infection or disease occur more commonly in infants. If your immune system is weakened for any reason, you are more likely to have infection complications. In particular, pregnant women should see their doctor if a tongue herpes infection is noticed. How is a definite diagnosis of tongue herpes made? Most doctors or dentists will be able to make a diagnosis of oral herpes from what you tell them and by looking at the sores. Tongue herpes sores have a very typical appearance that is very clear. If a definite diagnosis is needed, it's possible to do some laboratory tests on fluid from the sores. What's the best home care for tongue herpes? I think that any painkiller containing Ibuprofen is the best thing to take for fever and muscle aches. There is some research to suggest that Tylenol may contribute to asthma development in young children, so it's best to avoid Tylenol at this time in young kids. The next most important thing is to prevent getting dehydrated, so keep drinking lots of water. If your tongue is really sore, try sipping ice-cold water in tiny sips, almost constantly. A herpes infection on the tongue can be helped by avoiding toothpastes which contain sodium lauryl sulfate, which is an irritating agent. This is basically a type of soap, and causes your toothpaste to froth up so that it "feels more effective". Anyone close to you should avoid any physical contact with the sores, and epecially any fluid that leaks out of the sores. The fluid is absolutely packed with virus and is highly infectious. After about two weeks, things should be pretty much back to normal. It can feel like it takes forever - but you WILL GET BETTER, with or without treatment!